The multigrain and sandwich bread (or buns) can be baked on the same day that they are mixed. However, the 100% wholewheat bread is started on the evening before baking. Note that the rise time for any yeasted bread will vary depending on the temperature in the kitchen. If the kitchen is cold, put the rising dough into the oven with only the light turned on. If the kitchen is warm as it is in summer, let the dough rise on the counter. adapted from a recipe in The Five Roses Cook Book "A Guide to Good Cooking"
This is a variation of the recipe that my mother always made. I loved coming home from school to the wonderful aromas of bread just out of the oven and being given a warm slice slathered in butter. (Yes, yes, we know; one must never cut freshly baked bread until it has cooled... honestly, who can resist doing this just once? Or twice, or...?) Many thanks to Mom for a multitude of things, only one of which includes giving this recipe to me. In a small bowl, mix together the yeast and 6 Tbsp lukewarm water (do the baby's bottle test on your wrist) til creamy. Set aside. Add all but ½ cup of all-purpose flour and the yeast mixture to the large bowl and stir just enough to mix it together. Cover with plastic and leave for about 20 minutes. After 20 minutes has passed, put some of the remaining ½ c flour on your board for kneading the dough. Turn the dough out onto the board. Sprinkle the salt overtop of the dough. Knead the dough for 10 to 15 minutes until it is smooth and silky. As you knead, add as little flour as you dare to stop the dough from sticking. Keep scraping any dough that is on the board so the board is always clear. When the dough is kneaded, shape it into a tight, round ball. Put the dough in the clean mixing bowl. Cover with plastic and let rise in a no-draught place for 1 to 1½ hours. When the dough has doubled, gently deflate it and allow to rise to double again. (about an hour). A good way to tell if it has doubled is to wet your finger and poke a hole in the top of the dough. If the hole fills up, it hasn't risen enough. If there is a whoosh of air and the dough deflates a little, it has risen too much. If the hole stays in exactly the same configuration and the dough remains otherwise intact, it is ju-u-st right. When the dough has doubled the second time, turn it out onto the lightly floured board. Divide it in three equal pieces. Make three smooth balls and allow to rest for ten minutes. Then shape into rectangles and roll like jelly rolls to make 3 loaves. Put them seam side down in oiled loaf tins. Cover with plastic wrap then a damp towel and let rise again to almost double (30 to 45 minutes). If you are making buns, divide one portion of dough into 6 to 8 equal pieces. Shape each into balls and place them seam side down on parchment covered cookie sheets. Set them about 2 inches apart. Let rest for a few minutes then flatten each ball til it is about half the size of the bun you want to have. Cover with plastic wrap or a damp clean towel and let rise again to almost double (30 to 45 minutes). Thirty minutes before you are going to bake, turn oven to 450F. Just before putting the bread in the oven, spray the tops of the loaves liberally with water. Sprinkle sesame seeds overtop if you wish. Put bread on the second to bottom rack of the oven; put buns on the middle rack of the oven. Immediately turn the oven down to 400F. Bake the bread for 30 to 40 minutes or until it is hollow sounding on the bottom. You will probably have to turn the bread around once to account for uneven heat in the oven. Remove bread from pans and cool on sides on well ventilated racks. Wait til the bread is cool before cutting and/or storing it. 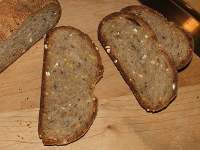 Adding a few tablespoons of ground flaxseed and/or a handful of rolled oats is a very nice addition and does not compromise the texture of the bread. This bread can also be shaped and baked free-form on a stone. Pita dough can also be shaped in thickish rounds, baked and used in place of hamburger buns. On the evening before you are going to bake the bread: In a small bowl, mix the yeast in ¼ c lukewarm water (do the baby's bottle test on your wrist) and make sure that it bubbles (about 10 minutes). Put the milk powder into a bowl large enough for the starter dough to triple. Pour in the rest of the water. Add the yeast mixture. Add the flour to the yeast mixture, mixing it in well with a wooden spoon. Add salt near the end. Stir vigorously in a circular direction for 5 minutes. Cover the bowl with plastic wrap and let the starter dough rise in a no-draught cool spot for 12 to 18 hours. On the morning of the day you are going to bake the bread: In a small bowl, mix the yeast in ½ c lukewarm water and make sure that it bubbles. In a separate bowl, combine honey and 1 c warm water. Add the honey water to the starter dough bowl and mix well. Let your hands be your friends by squeezing the dough between your fingers. Add the small bowl of yeast to this mess and stir vigorously. Add all but 75 gm flour to the bowl of wet ingredients, mixing well with a wooden spoon. Cover with plastic wrap and allow to sit for about 20 minutes. Pour some of the remaining 75 gm flour on a flat surface (wooden board) for kneading. Turn the dough out onto the board. Wash and dry the mixing bowl. Sprinkle the salt over top of the dough. Then knead for 10 to 15 minutes, adding a little flour at a time until the dough is smooth and springy. When dough has doubled, carefully turn dough out onto board. Cut it in two. Make two flat rectangles and fold them in thirds to create two long loaves. (or you can make one large round loaf.) Place on a cornmeal covered baking tray - or peel if you have one. Cover with a damp kitchen towel and allow to rise for about 1 hour til almost double. (Or, shape into rectangles and roll like jelly rolls to make 2 loaves. Put them seam side down in a oiled loaf tins. Cover with plastic wrap, then a damp towel and let rise again to almost double.) To test if it has risen enough, flour your finger and press gently on the edge - it should very slowly spring back. For comparison, try pressing early on to see how it quickly springs back when the dough has not risen enough. Just before baking, slash the tops of loaves with a very sharp knife. Place bread in oven and immediately turn oven down to 350F; bake the loaves for 45-50 minutes until hollow sounding on the bottom. Turn off the oven. Put the finished bread back in the oven and leave with the door ajar for 5 or 10 minutes. Remove to cool upended on cooling racks. Wait til the bread is cool before cutting it. In a small bowl, mix together the yeast and ¼ c lukewarm water (do the baby's bottle test on your wrist) til creamy. Set aside. In a small heatproof bowl, pour ¼ c boiling water over flax seeds, wheat berries, sesame seeds, cornmeal, millet, sunflower seeds and honey. Set aside to cool. Pour the rest of the water and oil into a large mixing bowl. Add oatmeal, wheat bran, wheat germ, and the flours except ½ cup all-purpose. Stir with wooden spoon til dry ingredients are roughly incorporated into the water. Add the cooled seed mix and the yeast mixture to the large bowl and stir just enough to mix it together. Cover with plastic and leave for about 20 minutes. After 20 minutes has passed, put some of the remaining ½ c flour on your board for kneading the dough. Turn the dough out onto the board. This is quite a stiff dough. Sprinkle the salt overtop of the dough. When the dough has doubled the second time, turn it out onto the lightly floured board. Shape into a rectangle and roll like jelly roll to make a loaf. Put it seam side down into parchment covered loaf tin. Spray with water and sprinkle the top liberally with sesame seeds. Cover with plastic wrap and let rise again to almost double (30 to 45 minutes). Just before putting the bread in the oven, spray the tops of the loaves liberally with water. Put bread on the middle rack of the oven. Immediately turn the oven down to 400F. Bake the bread for 30 to 40 minutes or until it is hollow sounding on the bottom. You will probably have to turn the bread around once to account for uneven heat in the oven. Remove bread from pan and cool on its side on a well ventilated rack. Wait til the bread is cool before cutting and/or storing it.